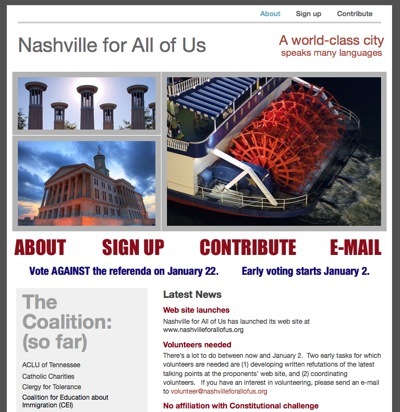 From now until January 22, the Hispanic Nashville Notebook will feature the Nashville for All of Us logo above, urging its Davidson County readers to vote AGAINST RATIFICATION of the constitutional amendment imposing English Only. It is reckless, rude, and red tape. It is frivolous legislation. "He just asked me if it was Christmastime"
As I walked past Our Lady of the Seven Sorrows Catholic Church and the statue of Chet Atkins tonight, I came upon Christ standing outside a closed store on a downtown street. He had black skin and a green bag holding all He owned in the world next to him. He was huddled to hide from the cold wind whipping through the buildings. He did not frighten me. 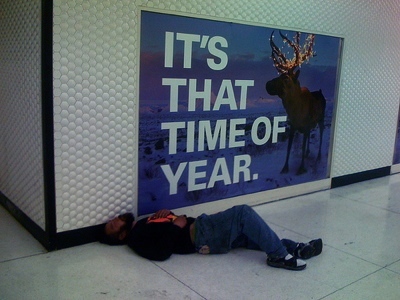 He just asked if it was Christmastime. Then I asked Him to come with me to the H.G. Hill store and I would give him the rest of the $20 bill in my hand after I bought salt and pepper for a salsa I was making for the good and most kind oncology nurses at Vanderbilt Medical Center. We walked into the store together, and so that the clerk would know, I identified my savior with these words, "you know you are Christ among us." My Lord answered affirmatively. And we walked to get the salt and pepper. Then we went to checkout stand. The nice lady made change, and I handed that money to Our Lord. Then He blessed me. And I took His hand with its spike wound and thanked Him for allowing me to see Him. I walked out the door. And my savior disappeared into an aisle looking for nourishment. As I walked back, I thought of other representatives of our savior in Nashville, targeted for ouster because they've set up a tent city, or asked for help on the city streets. Shame on us. Have we not read the Scriptures? Have we not read the stories of the saints? Have we not read Matthew 25 and the parable of the Last Judgment? Do we not remember that Our Lord was born in a manger, homeless, because there was no room in the inn? Remember. Christ is waiting for us. To recognize Him. And treat Him with recognition and love. Photo by Alex Chaffee. Licensed under Creative Commons. ¡Hola! Meet ChíChí&Flaco, a modern t-shirt line savoring the flavor of Latino and Hispanic culture in the United States. 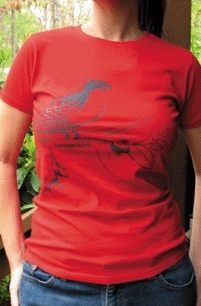 Created by the founders of Los Pollitos Dicen (The Little Chicks Say), the premier line of Spanish children's gift tees, ChíChí&Flaco offers the same wonderful quality and cultural celebration for babies, big kids and adults... niños of all ages! Expect fun, bold and super-fabuloso color and designs for everyone. Who are Chíchí & Flaco? Ever since Cuban-American co-workers Carrie (reporter) and Oscar (artist) first met in a newsroom in Tennessee, they called each other ChíChí and Flaco. They used these common nicknames to nurture their Cuban-American heritage in a VERY different land. Thirteen years later, they're still ChíChí and Flaco spreading their love of culture with fabulous t-shirt design and onto the backs of Latinos and Latinos-at-heart. A friend of mine with Korean ancestry asked me about a speech by immigration restrictionist Roy Beck of NumbersUSA. In it, Beck promotes the seemingly objective proposition that there are too many immigrants being allowed into the U.S. My friend asked me what the response is to Beck. I watched a video of Beck delivering his short presentation (gumballs have earned it a sticky notoriety), and one specific comment Beck makes before the 1-minute mark stood out: he calls "the 40 years before 1965" the "golden age" of immigration. When I heard that, the graphic above immediately came to mind. By "golden age," does Beck mean that the four decades of 1925-1965 had the right numbers of immigrants, or does he mean that those decades saw "normal" levels? The answer for Beck is, both. 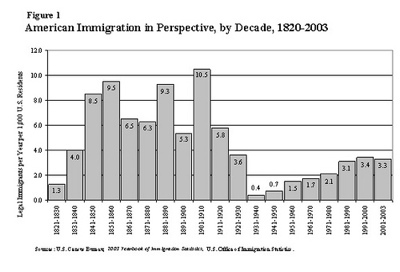 Even though many other decades of American immigration history saw much greater numbers than were seen from 1925-1965, Beck nonetheless describes the number of immigrants during that period as a "traditional level." You can judge for yourself which decades of American immigration have been more or less typical; I doubt you will choose 1925-1965. Even more sobering is the moral baseline Beck establishes by framing that period of time of our immigration history as "golden." This so-called "golden age" not only coincides with the Great Depression and its aftermath, but it begins immediately after the passage of the 1924 Asian Exclusion Act, which ushered in race-based immigration quotas and (as the name suggests) largely excluded Asians - necessarily meaning that most Asians who immigrated during that time period were illegal immigrants. The timeframe of this "golden age" concludes upon the passage of the civil rights-inspired Immigration Act of 1965, the purpose of which was to dismantle race-based immigration quotas. His own words should suffice. "You have to have some kind of benchmark." 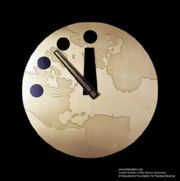 There has only been one period of a closed door in this country and 1925 to 1965. That is hardly typical. It was that restrictive policy that was behind the US turning away hundreds of thousands of Jewish immigrants in the Holocaust. Is there any more shameful period in American immigration history than the 1939 pictures of the SS St. Louis off the coast of Miami filled with 900 Jewish passengers? They were ultimately denied entry and the ship sailed back to Belgium. Most of the passengers died in concentration camps. My good friend Chuck Blatteis here in Memphis is the son of one of the few survivors of the St. Louis. I remember meeting Nashvillian Rosemary May a few years back. She was Dutch and ended up in a concentration camp after their US visa was ultimately delayed so long (quite deliberately, of course) that they were stuck in Amsterdam when the Nazis took over and rounded everyone up. Definitely a “golden age” in US immigration. The Knoxville News Sentinel conducted a roundtable interview with local Hispanic business leaders in that city - the article is worth a read. I do think that the state governments have certain measures to care for the community. Public schools do a great job of taking kids. They don't ask. They don't care if your parents are legal - if a kid was born here or not. If you live in the area, you come to school no matter what. So that's great. However, there are like three or four translators for the whole county. That's not enough. I've been as a mom in meetings at the school where all the parents are there and the principal of the school has asked me to translate? And he sits me in a corner with all the Hispanic parents, and me a parent, is translating the meeting. So, yes, they're taking the kids, but it doesn't stop there. A lot of these parents don't speak English. I'm just using public schools as an example because that's what I see every day. A Hispanic lady called me and said "can you please call school. They are calling me. I don't know what's happening. And they just tell me OK, OK." She didn't know what they were saying. I called. Her daughter was throwing up in the infirmary and they wanted her to pick her up. If you're going to take the kids, you need to care for that community. I was at the Citizens Academy of the FBI and one of the agents mentioned that the Hispanic community was growing and with the growth of the Hispanic community they also brought their problems, which is gangs. So I raised my hand because I thought, well I'm part of that community. I don't think I bring my problems like a gang. So I make the correction that the problems follow all these gangsters, they follow the community because we are a target of them. Then they made the correction and apologized. Photo by Timothy Wisniewski. Licensed under Creative Commons. 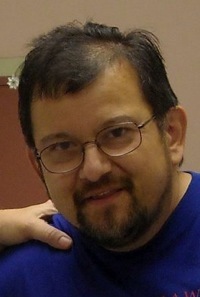 Tim Chavez, the former Tennessean columnist who now blogs at Political Salsa after a near-fatal bout with cancer, tells the recently laid off employees of his old paper that "life can still be meaningful," even in circumstances one might otherwise consider a failure. But God still provides us opportunities. Yes, I'm still a failure. I make little money compared to what I did as a columnist with a long career. I feel shame and am glad my parents are not alive to see me this way. But I still believe God kept me alive for a reason. The Tennessee Minority Supplier Development Council will host, and the Tennessee Hispanic Chamber of Commerce* and Nashville Area Hispanic Chamber of Commerce* will co-sponsor, a Holiday Celebration on Friday, December 5, from 5:00 p.m. to 7:00p.m. The event is free and offers refreshments and prizes. RSVP to 615-259-4699. 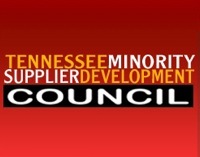 The Tennessee Minority Supplier Development Council is located at 220 Athens Way, Suite 105, Nashville, TN 37228. They have a sign up page, and contributions are being accepted for a campaign. 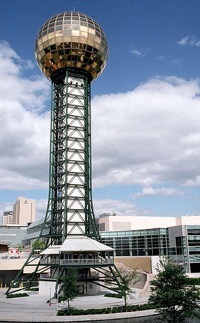 I have already signed up the Hispanic Nashville Notebook as a member of the Nashville for All of Us coalition. Please continue to advocate as you have been, but now there is a new, city-wide group for us to get plugged into as well. 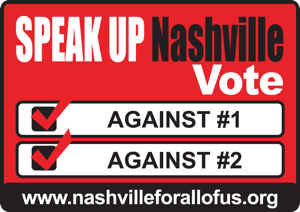 Please also consider if your own group should join the growing number of supporters of the Nashville for All of Us coalition. "My daughter wrote me a beautiful note, thanking me for pushing her to excel"
"As soon as I heated up a tortilla... I was close to tears"
Last night, the Primary Wife and the Kids and i had a nice dinner, and I even got some PJ’s I can’t wait to wear. It was terrific. My daughter wrote me a beautiful note, thanking me for pushing her to excel and basically acknowledging that I indeed, along with her mother, do my best to provide for her and her brother. It was a wonderful gift to get. I was a little tired. But, more than that, a bit pre-occupied. See, i have been been thinking about my parents quite a bit lately. Though they are both gone, for some reason, I feel very close to them right now. Tonight I cooked a fried chicken dinner for me and the kids, and the smell of frying chickens almost made me sad. I can’t explain it. 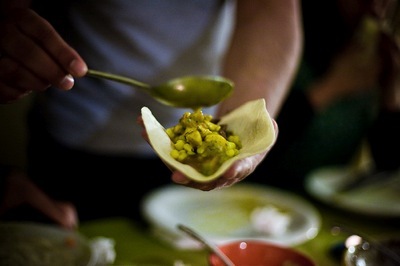 As soon as i heated up a tortilla to eat with it, I was close to tears. I could feel my mother in the room. She was standing at the stove, at 3:00 a.m., cooking me a tortilla with butter because i decided to bang on her door at 2:55 a.m. The very first question out of her mouth was “are you hungry, Mijo (Mi Hijo)?" Read the original in its entirety here. Photo by Joey Gannon. Licensed under Creative Commons. Photo by Sergio Recabarren. Licensed under Creative Commons. Mayor Karl Dean recognizes "the thousands of Hispanics in Nashville whose love of family, hard work, and sense of community have helped unite us"
Following a powerful rendition of the National Anthem by Hispanic-American singer Rachel Rodriguez, an eloquent Mayor Karl Dean presented to NAHCC members and guests a Proclamation recognizing "the thousands of Hispanics in Nashville whose love of family, hard work, and sense of community have helped unite us." The program continued with the invocation by Pastor Tommy Vallejos, Director of H.O.P.E (Hispanic Organization for Progress and Education) and a message by Fabian Bedne, Raúl Lopez and Santos Gonzales with "Ya Es Hora Tennessee" a grass root Hispanic voter registration and civic awareness group launched earlier this year.